If I could only have one book to use for counseling purposes, this would be it. This book is extremely versatile. It can be used for any type of separation, loss, group counseling termination (great way to end a group), intake (learn a lot about a child) and identifying ones’ support system. The premise of the book is that we are all connected by an invisible string. Even though it is invisible, you can feel it with your heart. Everyone has an invisible string, and it can reach anywhere, even heaven. The book’s message is that no one is ever alone, even when their loved one is not physically present. I created, Tug on My heart, which is a follow-up activity for this book. Objective: Student(s) will explore their connection with loved ones. This lesson is great for any type of separation (divorce, death, deployment, incarceration, separation anxiety, traveling parent, etc.) experienced in the child’s life. It also illustrates who is part of the child’s support system. Procedure: Read The Invisible String . 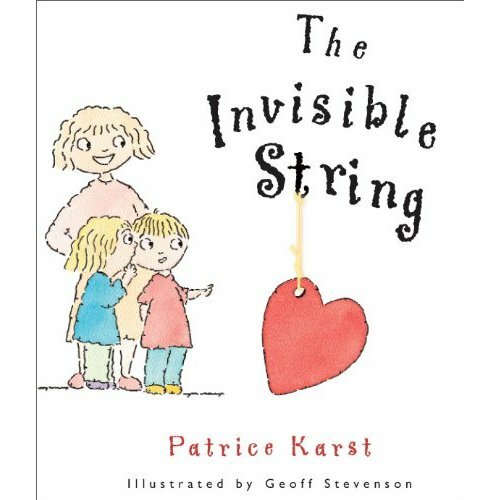 Ask your students to list people and pets they believe their invisible string is connected to. Remind students that their string is strong and long enough to reach anywhere. Give each student a heart for each person or animal they listed. Direct the students to write the name or draw a picture of the person they are connected to on each heart. Use the clear string of your choice to connect the student’s hearts. Students may either use the connected hearts as a charm bracelet or necklace depending on the length and size. Tell me about your invisible string. Who is connected to your invisible string? Whose heart is the farthest from you now? Whose heart is the closest to you now? Which connection feels the strongest? Which connection feels the weakest? Is there someone you wish was connected to your heart that isn’t? How do you know if your heart is connected to someone else?